Is it odd that I actually liked writing term papers? Research is fun for me. I realize that that is one of the reasons that I love leading tours at the Smithsonian National Portrait Gallery. In order to share the art and the history with visitors, I am required to research. My love of research is why working in series makes since for me. For the "From Just a Seed" series, visiting the historic and amazing trees is part of the fun of making the work. Finding out where the trees are located, and a little about the history of the trees feeds my love of research. This painting represents a famous tree because it was planted by one of the most famous people in American history. It is located on the Mount Vernon estate and was planted by George Washington. Now, I love George Washington. His life was astounding. In fact, I have read at least 2 books about our first president this year alone. I always share an image of him when I lead tours. He looms large for me. On the grounds of Mount Vernon, Washington used a very symmetrical gardening plan. If there was a tulip poplar on one side of the garden, there would be a matching tree on the other side. If you visit Mount Vernon, you may see this tree on one side of the bowling green, which is the large expanse of yard as you enter the Mount Vernon estate. For this painting, I wanted to show how the tulip poplar shoots up into the sky. In the lower right side of the painting, you will see the beauty of a tulip poplar in autumn, while in the upper left side of the painting, you will see the leaves of the tree. Each painting in this series provides a little story about an individual tree. Tulip Poplars are native to the east coast of the United States, and can grow up to 160 feet in height. I really enjoyed reading your blog. The article about the healing power of art brought me here from your newsletter. I've always felt that making art heals, but never thought of it from the angle of viewing art. I'm curious about this painting. What paint did you use, acrylic? Is is primed in a metallic bronze or is it just the way the light hits? Thank you! Thanks so much for letting me know that you enjoy reading my blog. I will keep you posted via my emails whenever I have a new blog published. Yes, I used acrylic for this painting. 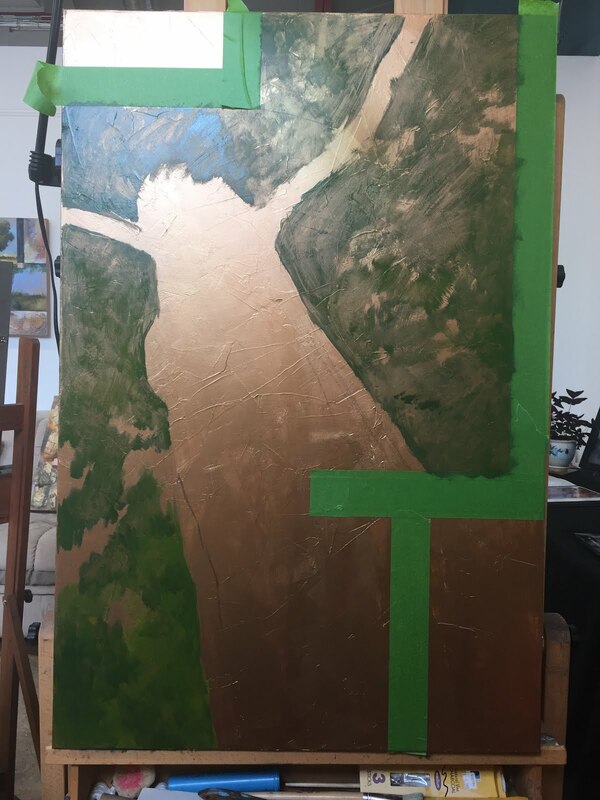 The canvas is primed in white gesso, but I did paint the entire canvas in copper acrylic paint prior to continuing with the piece. A textured surface was also applied. Thanks again!